Bee Orchid is not easily confused with other wild plants on this web site. On dry, sandy soil, dunes and limestone pastures, in June and July this is such a delight to find. 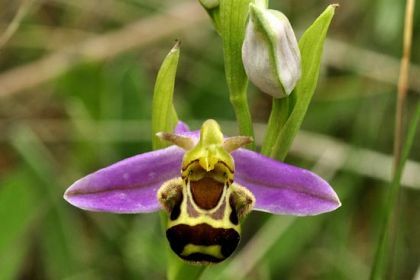 There is no problem identifying a Bee Orchid from all other orchids – its lovely gold and brown velvety lower lip is patterned to resemble the back end of a visiting bumblebee, this in order to attract a similar insect and thereby assist in pollinating the plant. This perennial orchid grows to about 30-40cm high with an erect stem which is clasped by two oblong, lanceolate leaves. Several other leaves form a basal rosette. The unmistakeable flowers are borne in spikes and have three spreading pink sepals, two short green upper petals and a large round lower petal which is deep brown and has gold markings. This is a native plant and it belongs to the family Orchidaceae. All wild plants are given some measure of protection in Northern Ireland under the Wildlife (NI) Order, 1985. 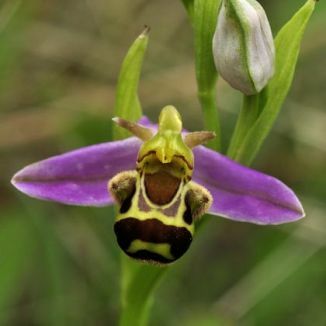 The Bee Orchid listed in Schedule 8, parts 1 and 2, is given special protection. To learn more about our Irish orchids, I would heartily recommend a really superb book on the subject which is published by the Collins Press and entitled 'Ireland's Wild Orchids - a field guide'.